The full-back played on trial for the Buddies against Queen of the South in midweek. Danny Grainger has agreed to a one-year deal to join St Mirren for the forthcoming campaign with the option of another season. Grainger is a free agent after leaving Hearts this summer and the left-back trained with St Mirren before playing as a trialist in a 4-2 friendly defeat at Queen of the South on Tuesday. 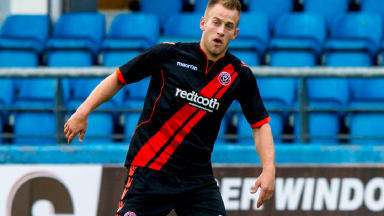 He had previously spent time training with English sides Blackpool and Sheffield United this summer. However he has now opted for a move to join the 2013 League Cup winners. St Mirren manager Danny Lennon told his club's official website: “We lost a very good left back at the end of last season when Paul Dummett left to fight for a starting place at Newcastle United. Danny is a top quality left back to replace him.